I'm in the process of replacing the accumulator/suction line assembly, and ran into a somewhat odd fitting detail on the compressor inlet. 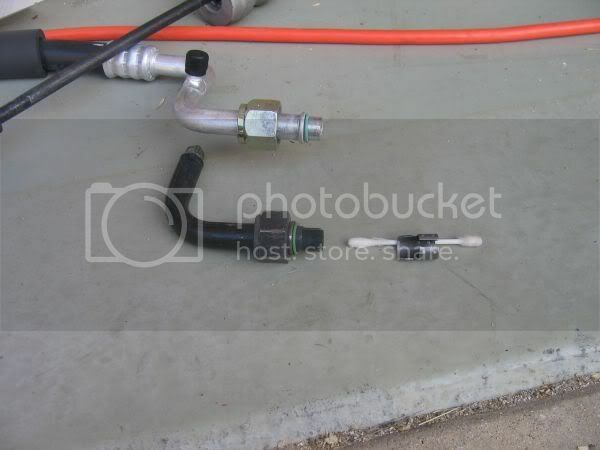 The black fitting is the (presumably) factory hose with what appears to be a fitting detail intended to "key" the pipe to the compressor inlet. The replacement line does not have this fitting detail. Is removing the piece inside the compresssor inlet appropriate to do in this case? Thanks. 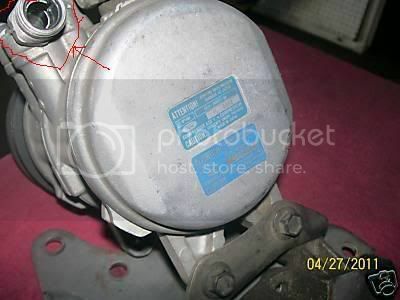 I don't believe you'll need the key section with the replacement hose assembly, as long as it fits and the O ring seats properly, the nut then holds it tight..But be sure that the new line does fit snugly inside the compressor section, and the O rings seats .. Thanks for the feedback. I've heard of another person cutting the same profile on their replacement pipe, but I'd prefer to avoid that, given that I can't flush the line from the other end (attached to accumulator). Ditto. Ran into same exact issue with my '89. No need for the keyed end. How did you get that insert out of the compressor inlet? It looks like a total pain to remove! Nevermind. I got it out.